Are you, like me, on a constant quest for the perfect white tee shirt? I swear that if I had a dollar for every minute I’ve spent on line shopping for white tees I could open a factory and make my own. Not that there is a dearth of white tee shirts available. There are thousands. Every retailer has several on offer so what’s the big deal? I’ll tell you. There is something about a tee shirt that has to be just so. The fit, the length of the sleeve, the neck, the fiber content, the denier (that’s the weight of the fiber content) the cut, the length. Am I right? If it’s too short it looks like a box. If it’s too long it looks like your daddy’s undershirt and forget about tucking it into a skirt (notice I didn’t say anything about tucking it into your pants. Don’t.). If it’s too baggy it’s unattractive. If it’s too tight it’s uncomfortable and not too classy, I might add. Then there is the question of whether it’s a tee shirt to wear by itself (thicker) or under a sweater (a little thinner), short sleeve, ¾ sleeve, long sleeve, V-neck, crewneck, ballet neck, scoop neck… This is an ongoing search because a white tee doesn’t last more than a season or two at most. They stretch out, they lose their shape, the armpits turn yellowish, but mostly they get that dingy look and that’s when you know it’s time to polish your furniture with it. Lately, when I find a tee shirt I really like, I’ve gotten into the practice of buying in bulk and stock piling them in the attic. I dole the precious garments out to myself two at a time—one to wear, one to wash—keeping the others for reserve. I personally prefer 100% cotton and I’ve found that price point isn’t always a measure of quality. There’s a wide range out there; some pricey, others very reasonable. On the high end, Michael Stars makes lovely shirts in different denier weights and amazingly, his one-size-fits-most actually does. I don’t get it, and maybe larger sizes would not find his shirts as accommodating, but I find they fit very well. On the other hand, Target, my go-to store for practically everything, has very good quality tee shirts under their “Mossimo Supply Co.” and their “Merona” brands. They wash well, last a long time and are usually under $10, sometimes on sale for as little as $5. And the best part, they have no label inside to irritate the back of your neck and drive you nuts. Buy a bunch and fuggedaboutit. Banana Republic has a nice one they call their “Timeless Tee” that runs about $22.50, but don’t pay full retail. They regularly have promos that will give you a percentage off. 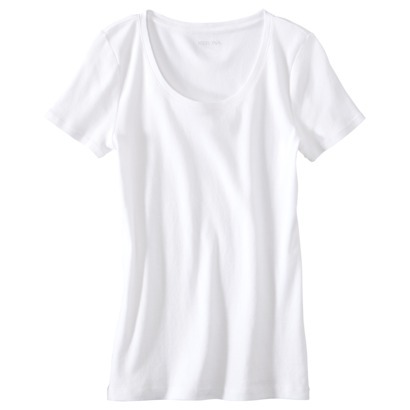 J.Crew also has some nice basic tees in their catalogue but I find these tend to look best on me when I’m skinnier. ‘Nuff said. So what do you do if you’ve spilled chocolate gelato or coffee down the front, or worse yet, worn it to an Italian restaurant and ordered the spaghetti and meat balls. You know what I’m talking about. That one stray strand of spaghetti goes “Thhhwwap” and you have an orange stain on the front that will never come out. AAARRRGGGHHH. As soon as I can, I blot it with some hot, hot water, and then shoot it with some Oxi Clean Max Force Laundry Stain Remover spray. Wash it on the gentle cycle with some Ivory Snow and usually it’ll be good as new. And as an extra precaution, Shout Pre-wash comes in little individual tear-open packets. I always carry a couple in my handbag. Of course, if that doesn’t work, it’s up to the attic for a new one from stock! Good to know, Jessica! Thanks for sharing that. Thanks for the tip Judy! I have great luck with Petit Bateau Tees. I can still get my old body into the size 18 ans. As a matter of fact, Joan, I do! Check out J. Crew’s http://www.jcrew.com/womens_category/shirtsandtops/classicshirts/PRDOVR~29865/29865.jsp I have a bunch of the longer sleeve and they both come in petite for us smaller people! Off to Target for my perfect Tee! Thanks! And, if you have any tips on where to find that perfect fitted, white blouse in 3/4 length sleeves, I’d appreciate it! I should have written sooner cause I LOVE your blog. I appreciate your tone — both funny and wise. I LIKE the look of cropped pants! I don’t have the right body and don’t wear them, and if I did it wouldn’t be with clunky sneakers, but I like the way they look on slim, young women. And I laughed at your white t-shirt quest. I am always looking for BLACK ones in soft cotton or bamboo! My kids and I used to joke that whenever we ate pasta with tomato sauce we invariably had a white shirt on. So, I don’t really have a “look” but I turned 70 this summer and never felt better! After 2 new knees I LIKE going to the gym. But I’ll try your 7 minute workout . And keep reading your blog! I can totally relate to the search for the perfect white tee shirt! Thanks for all the good tips! Wow. Fabulous. Thanks for the tip Liz. And thanks for writing! love white cotton. if terribly stained. i drip (using an eyedropper that i keep next to the washing machine) diluted bleach on it, then drop in the wash. red (even wine) comes out with oxy.